Over the years, the Pantene formula have been refined and re-developed and these days with improvements in technology findings, it is constantly evolving and advancing its hair care products. 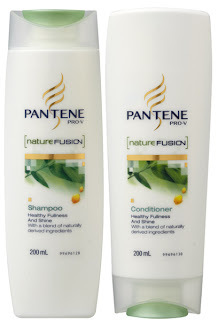 Pantene’s latest line of products is the Nature Fusion in which contains the newest buzz ingredient in hair care - cassia flower extract, proven to promote the health of hair and have previously used in Ayurvedic medicine and haircare for centuries before. Contains 2 varieties of cassia seed extract (cassia obtusifolia and cassia tora) to maximize the healthy hair benefits. Also contains naturally derived ingredients such as avocado oil, grapeseed extract and bamboo extract to penetrate into hair and strengthen it from within. Coupled this with the high-tech Pro-V formula and a soft fruity, you have a winning creamy formula that spreads easily to leave each strand of hair more conditioned and stronger than before after continued use. My hair is soft, lightweight and full of body and shine after use of the shampoo and conditoner. The most impressive thing for me is the difficult to manage ends that seem to flick in all directions are well behaved and easier to style. It definitely is my favourite range from Pantene to date and the conditioner is officially my new love! I also notice few hair breakages after 3 weeks of use of this latest range –testament that my hair is getting healthier and stronger. I’ve always enjoyed using Pantene hair products and appreciate their affordability (especially when they are on sale). In fact, I first tried them out some 15 years ago on my thick, wavy and somewhat coarse hair and they always managed to tame them and give me good-looking locks. 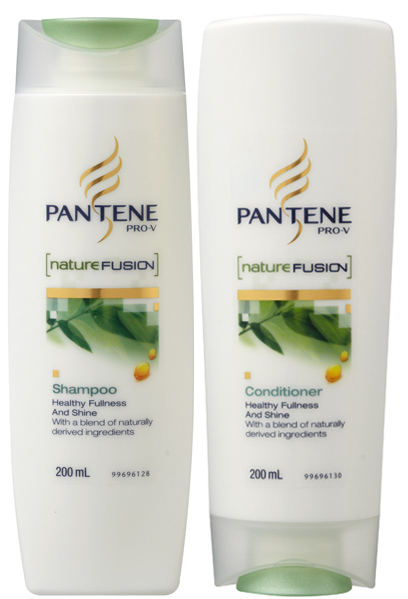 I know some people don’t like Pantene shampoos and conditioners and it often gets a bad rap but I think that’s because they are a big brand and an easy target to pick on because frankly the claim of it being filled with silicones (hello – so does 100+ other brand’s shampoos) and it will make your hair fall out (bah – I wish, because I wouldn’t mind thinning out my thick mane) are baseless and bias. Of course, I also use a clarifying shampoo on a weekly basis to remove residue and any silicone build-up from the various hair care products I use throughout the week. I think this is something most of us need to look into if our hair feels weighed down and coated with too many products and think its the regular shampoo causing the problem. There's every chance that Pantene may not work for you depending on your hair type (I find that it works best for fuller thicker hair types rather than fine-haired people), but you can only try and find out for yourself whether the product is suitable for you. At least it is cheap enough that if it doesn’t agree with your hair, you didn’t spend a fortune to find out. For me, it is an affordable everyday shampoo and conditioner that works well while I leave the more pricy salon speciality ones for weekly use. 200ml RRP $4.89 at major supermarkets, Priceline and various pharmacies. A sample of the above product was provided for consideration.